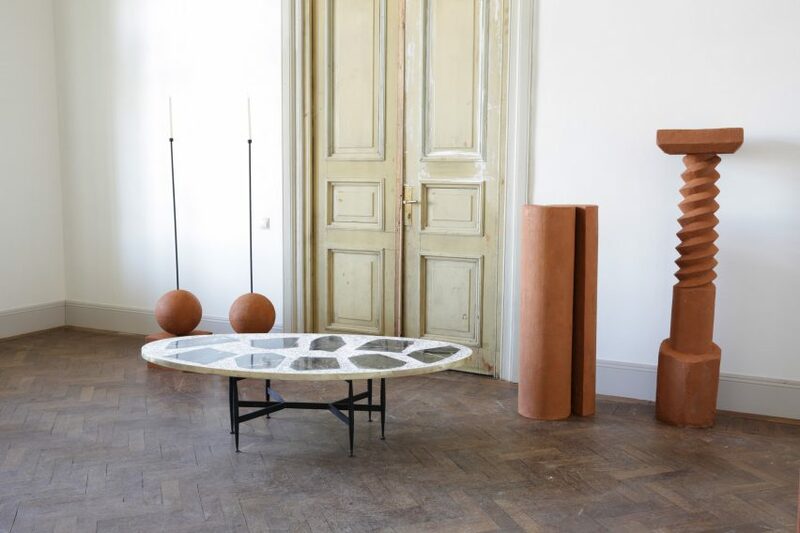 A marble table with a ball for a base and a collection of benches inspired by brutalist bus stops feature in this collection of furniture by Georgian design duo Rooms. Called Life On Earth, the collection consists of 12 handmade objects, made from a combination of natural stone and composite materials. 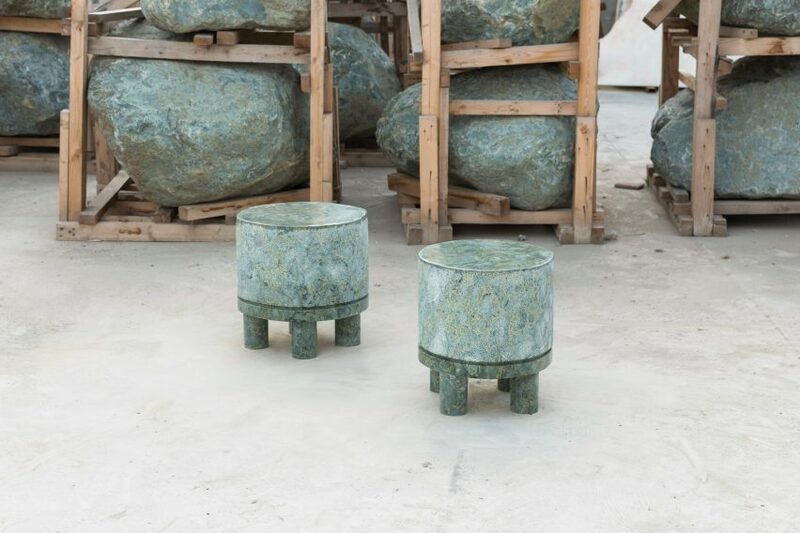 According to Nata Janberidze and Keti Toloraia, founders of Tbilisi-based Rooms, the pieces reference different aspects of their childhoods growing up in Georgia, and their experience of Asian and European culture. It brings in elements of different architectural monuments and movement, from soviet monuments to brutalist architecture. “We also wanted to be more aware of what lies beneath the things that were made centuries ago and how they endured time. The idea was to reiterate the fact that nothing really changes. Permanence is a leitmotif that runs through the whole collection,” they told Dezeen. 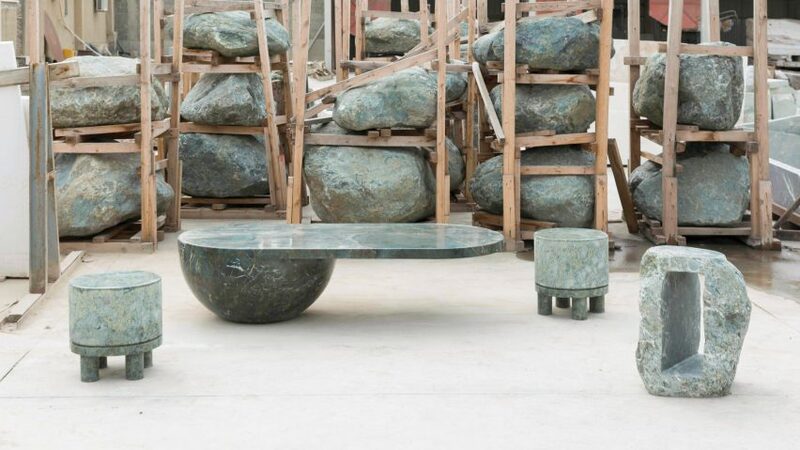 The Primitive Coffee Table is a green-hued marble table, featuring an oval-shaped surface that cantilevers off a semi-spherical base. It is complemented by the Primitive Chair, which sits on four cylindrical legs, and the Carved Side Table, which has a hollow centre. Both are also made from the green marble, supplied by Georgian stone company Kamara. There is also the Wheel Side Table, which has a marble cog-shaped base and a thin metal surface. 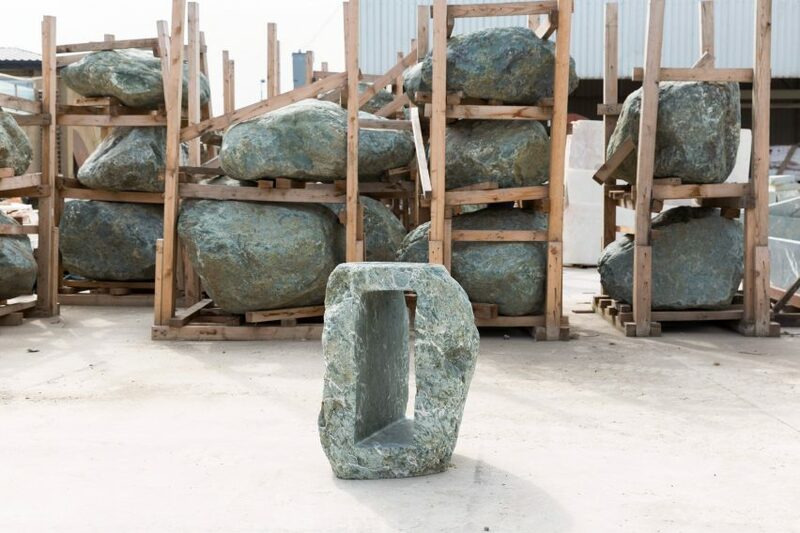 “Organic contradictions of life are translated into materials used in the collection, such as various natural stones that are juxtaposed with the combined composite material,” said the designers. “Bringing humour and surprising twists into the collection we make the whole experience of life on Earth more entertaining,” they said. The Bus Stop Bench takes its cues from bus-stop seats installed in soviet countries between 1922 and 1991. Available in a small and a large size, the concrete bench features a long body that curves upwards at the sides. “The brutalist shapes of the soviet bus stops and public benches were a huge influence,” explained Janberidze and Toloraia. 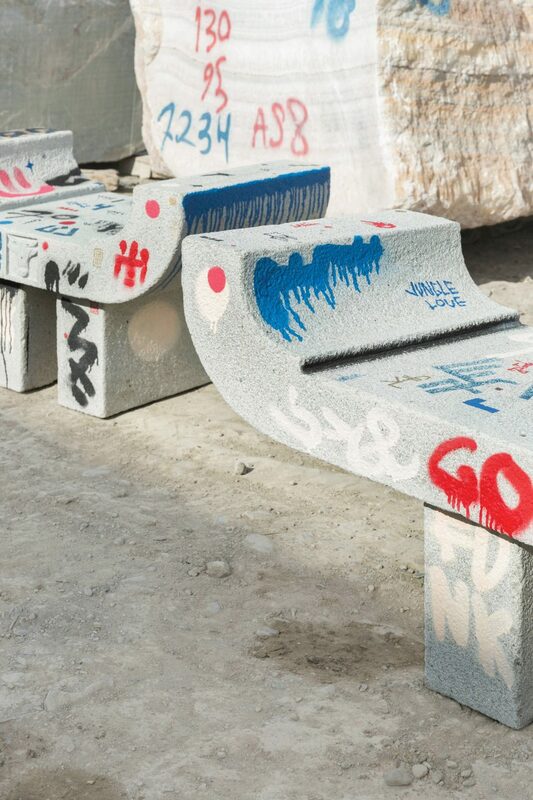 Artist Max Machaidze worked together with the duo to illustrate the bench with graffiti. 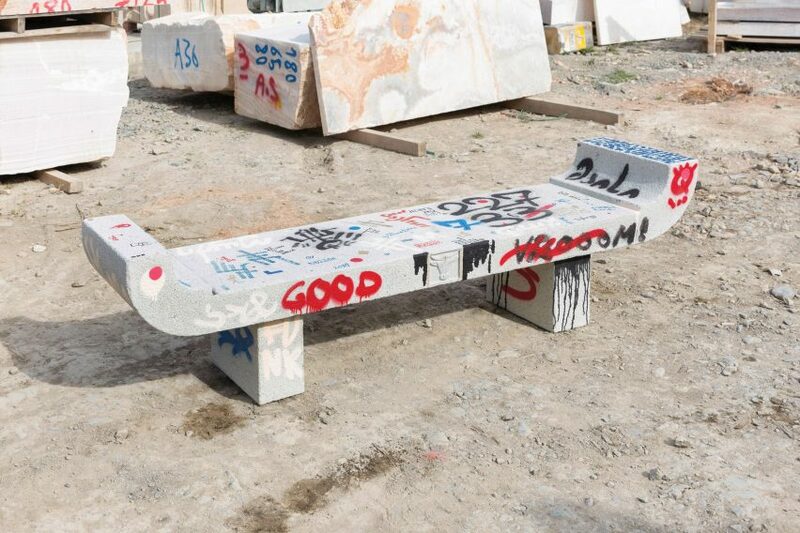 “By collaborating with artist Max Machaidze, we wanted to illustrate how the objects change their initial appearance and how other people’s input to put graffiti and their signature messages, transform the benches into the functional art objects,” they explained. The Magic Stone Table features an oval-shaped white composite-stone surface with accents of black stone. 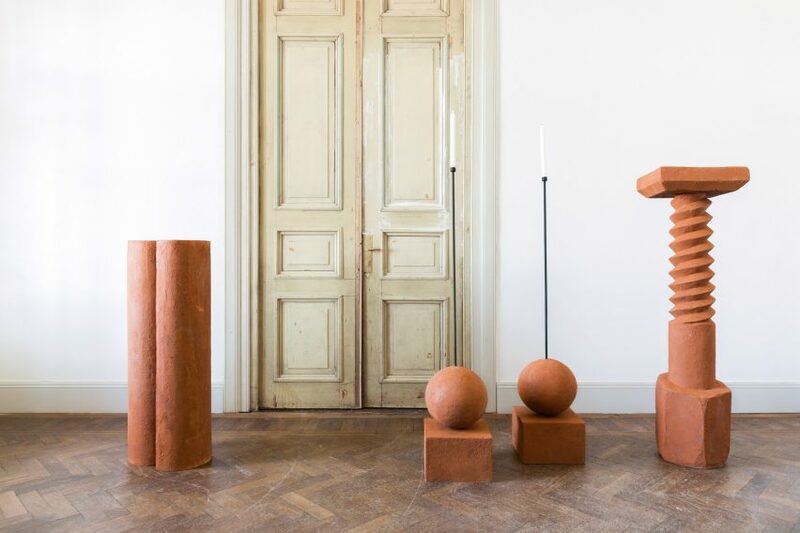 Other pieces in the collection include two sculptural terracotta pedestals, and floor-standing candlesticks made from terracotta and cast iron. Janberidze and Toloraia founded Rooms in 2007. They presented Life On Earth as part of a retrospective exhibition at Milan design week, called Sculpting in Time, hosted as part of the Alcova show from 17 to 22 April 2018.